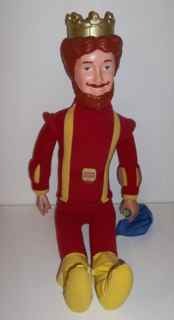 The Magical Burger King Doll by Knickerbocker is 20" tall. In his right hand is The Magical Scarf Trick. Crown is marked on the back: "1980 Burger King Corp". The King is in excellent condition.